The Buccaneers were in the playoff mix but a loss to the Saints at home basically sank any and all chance they had of making the postseason. Can they bounce back on a short week on the road against a Rams team that is actually coming off a victory? I'm not so surem so give me the Rams on Thursday night. A Saturday night special in Arlington is what we have here and while the Cowboys may still be mathematically alive in the NFC East, after a shoddy showing in Green Bay on Sunday they basically are dead. Meanwhile, the Jets are sticking around in the AFC Playoff race with three straight victories. I like them to make it four in a row this week. The Bears aren't a bad road team but they did just allow Washington to get their first road win this past week, so I'm not that high on this team right now. Minnesota really needs this victory after sliding in the NFC North race thanks to two straight losses but simply put, they are the better team in this matchup and as they return home, they will show it. We could go on about how terrible the Falcons continue to look, or we could talk about how good the Jaguars are looking offensively at the moment. Although they are 1-1 in their last two games, they have put up a combined 90 points in those contests, including putting up a 50 burger in a huge home win against the Colts. They're have reinserted themselves in the AFC South race and with a nice win over the Falcons, that will only continue. It is fitting that the game deciding first place in the AFC South will be decided by a quarterback showdown of two backups in Matt Hasselbeck and T.J. Yates. Gross. Houston didn't look that good at home against New England, but Indianapolis has continued to look terrible as now they may have to rely on the Great One, Charlie Whitehurst (now it appears that it will indeed by the Hasselbeck). I think the Houston defense will make the difference here on the road. I do think that if the Panthers win on Sunday in East Rutherford, there will more likely than not finish the regular season without a loss. However, I also do not think that the Panthers will be undefeated come playoff time. Put two and two together and yes, I am feeling the upset. I think that Eli Manning will be able to have some success throwing the football downfield and he and Odell Beckham Jr. will lead the way for a huge Giants victory. Picks like these are almost too easy. The Patriots got back on track with an impressive victory on Sunday night against the Texans after their two game losing streak, and now they get to return home to take on a bad Tennessee team that just got smoked by the Jets. Tennessee has had some success against the pass at times this season but on the road, they've got next to no shot. If Washington can actually win on the road (albeit against a bad home team in the Bears), they may not be all that bad after all. Buffalo, like all of Rex Ryan's teams, have been all over the place this season but they have also been in every game this season to their credit, although they did drop a winnable one in Philadelphia on Sunday. It will be a close one, but Washington's performance at home will be the difference. Even at home, the Ravens were thoroughly outclassed and dominated by the Seahawks on Sunday. They'll give it a go once again at home but if you're trying to tell me that a team quarterbacked by the immortal Jimmy Clausen and take out a hot Chiefs team, you might as well try to sell me the Brooklyn Bridge. Having won four contests in a row, the Seahawks have got their groove back (like Stella) and may just be a serious contender in the NFC yet again. Meanwhile, Cleveland did win against the 49ers, but the 49ers are awful. Does anybody think that John Football will be able to go into Seattle and pull a major upset? Seattle is my Lock of the Week. This could be a good one. Oakland was truly atrocious in the first half against the Broncos, but they looked great in the second half thanks to a dominant performance by Khalil Mack en route to a big victory. Meanwhile, the Packers finally showed some semblance of a rushing attack en route to a clean victory over the Cowboys. I do like the Packers here on the road but Oakland will make it interesting. 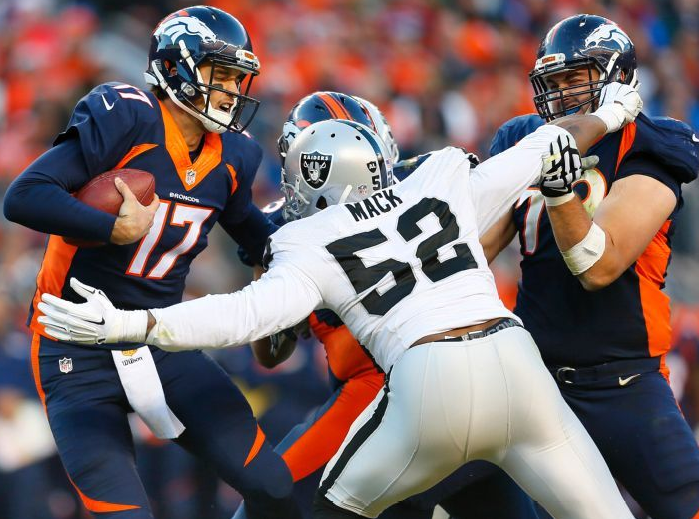 Denver suffered a disappointing home loss when they fell apart in the second half to the Raiders and now they have to go on the road to take on a very hot Steelers offense. Ben Roethlisberger looks healthy and has been successfully throwing the ball all over the yard for the past few weeks. This game has a lot of potential playoff implications and I like Pitt here. Neither of these clubs has anything to play for at this point save for draft positioning, so this should probably be one of those games to safely ignore. San Diego is pretty bad and certainly not healthy, but look for a big performance from Philip Rivers to lead the Chargers to victory here. Frisco, as I mentioned earlier, isn't good by any stretch of the imagination but they may have an opportunity here as the Bengals will be starting AJ McCarron under center in his first ever NFL start. McCarron didn't look all that great when in relief of an injured Andy Dalton on Sunday but he should be able to get some things done against a mediocre defense, even on the road. Philadelphia has won two games in a row to remain tied in the NFC East, but we all know that the Patriots win was a fluke and the Bills win was not all that impressive. Perhaps that Chip Kelly will be able to scheme the Eagles into a competitive contest against an excellent Arizona club, but they're just outmanned to the point where I don't see it happening. I certainly won't be going out of my way to watch this game (even at work) and I suspect that you won't too (unless your team is involved, of course). Detroit has now fallen back to Earth with two straight losses after that three-game winning streak, and losing in St. Louis isn't exactly a good look either. New Orleans isn't any good either but they have looked good the last two weeks and I like them here at home. The Hawks will bury Cleveland for sure but New England will swat the Titans by more and that is my LOTW. the Patriots win was NOT A FLUKE!! !